When I looked in my inbox and saw that there was a new Heather Grey release to review, I was stoked. 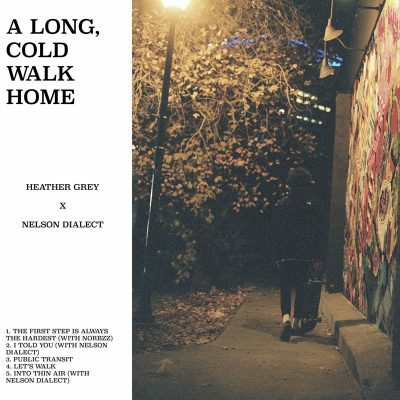 The last time I checked out a Heather Grey album, I was blown away with their simple and beautiful beat-making and sample use. A Long, Cold Walk Home continues to delight with a throwback, lo-fi sound that wouldn’t sound out of place on the many different “Chill Beats To Study To” playlists that seem to be everywhere. A Long, Cold Walk Home opens with “The First Step is Always the Hardest,” a shorter instrumental track with a cool, looping piano riff and jazz-flavored percussion. I found myself replaying this track, wishing it was just even a minute longer so I could fully drift away in this mellow beat. “I Told You” follows with a sound that is nostalgic of ’90s underground hip-hop. This, paired with the lyrics of the track, imparts a Shing02 type of vibe. The next two tracks, “Public Transit” and “Let’s Walk,” both continue combining atmospheric and old-school-style instrumentals. “Public Transit” uses a relaxed piano loop and beat that allows the track to sound minimalistic, which, in turn, makes it amazing music that can be listened to again and again without sounding tired. “Let’s Walk” comes in with a harp riff, which brings this album into more of a dreamy state—and when the song breaks halfway through, it allows the harp to sound haunting in a beautiful way. “Into Thin Air” closes the album, which has a Nas vibe to it that leaves you wanting more from Heather Grey.